Last week I had one of the best summer salads ever – okay so I know I say that about a lot of great recipes – but this one was really amazing. It was the Health Starts Here California Quinoa salad from Whole Foods deli. The HSH deli items at Whole Foods have no added salt, oil or sugar. 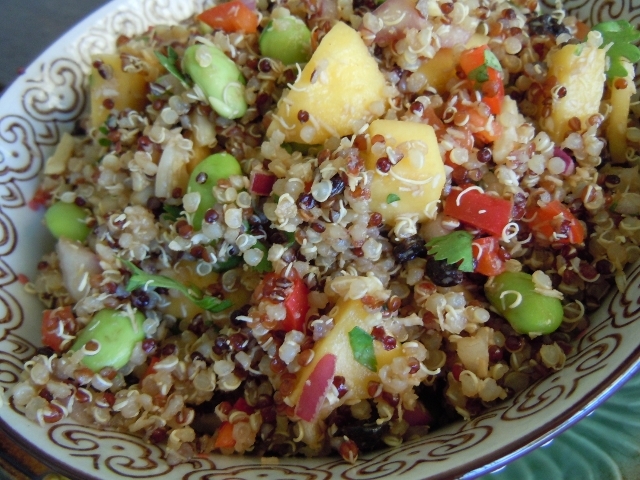 This salad was the prefect balance of fabulous ingredients starting with protein packed quinoa, including tropical flavors like mango and shredded coconut then studded with sweet dried currants, edamame, red onion, sweet red bell peppers, fresh cilantro and fresh lime juice. Are you drooling yet? Sometimes Whole Foods will have the recipes for deli items on their website but sadly this one wasn’t listed. The only thing I could do was to try and create it using the list of ingredients on the box. Guess what? My version was a huge success, in fact I liked it even better than the Whole Foods version! If you don’t have any mango use pineapple. 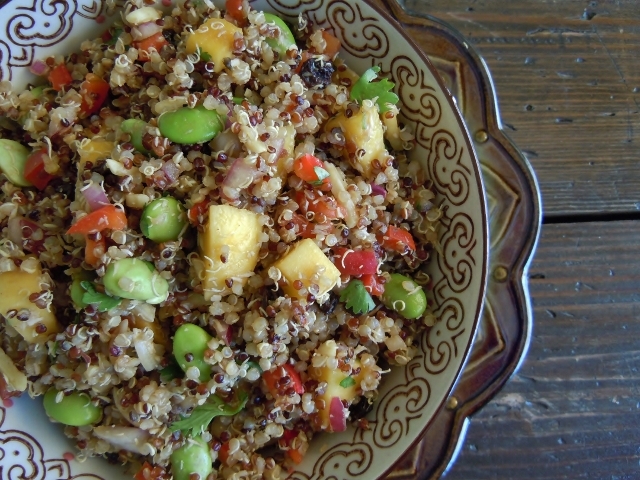 This recipe makes a huge amount which is great for taking to a picnic or potluck. If you are making it for a smaller group feel free to cut the recipe in half. It’s the best combination of ingredients and so healthy! Eat it alone as a entree salad served over a bed of baby greens. Perfect as a side dish to a veggie burger or a cup of soup. Hubby Tom and I have been enjoying this salad and it’s going on the menu again soon. In a medium size sauce pan mix the water and quinoa, over a medium heat bring to a boil, reduce to a simmer, cover and cook 10-15 minutes or until all water has been absorbed. Set aside to cool. If you are in a hurry, line a baking sheet with parchment paper and spread the hot quinoa out on it and it will cool down fairly quickly. Once the quinoa has cooled down transfer it to a large mixing bowl and combine with rest of ingredients. Chill before serving. In the past due to so much comment spam I had to close comments to recipes to keep control of the spam bots. Well some time back son David installed a better comment spam filter so now comments are open on the recipe pages. If you try a recipe and would like to comment on how it turned out or what tweaks you made to it, feel free to leave a comment on the recipe page. Not only does that help me out, but its quite helpful to folks who are looking at the recipe and thinking about trying it. I was going to post yesterday but I never had enough time to sit down at the computer! It was one of those day where as soon as one task was done another one was started. Much was accomplished and that is always a good thing. I like being busy and productive! I find that I don’t have the mental energy later in the day to post. I am such a morning person, it’s my most productive time of day and my favorite part of the day. Thanks for reading. Feel free to leave a comment or ask a question! Wow, that salad looks great. Can’t wait to try it! I have had that salad!!!! I have been getting there 5 for $5 on Thursday & posting & tweeting & Instagramming about it – LOVE!!!!! They have another one that is great too!!! Kale salads too! $5 – what a great deal! Well then Jody you know how wonderful this salad is! My store doesn’t have the 5 for $5 on Thursdays. I do like their kale salads too – such yummy goodness and healthy too. What a refreshing looking salad! I love substantive, entree-worthy salads for filling and healthy meals. Plus, mango makes almost everything better! Oh my goodness you are a morning person Andrea 4:00 am is early!